Gramacho, Pinta, Silves, Alto or Vila Sol. 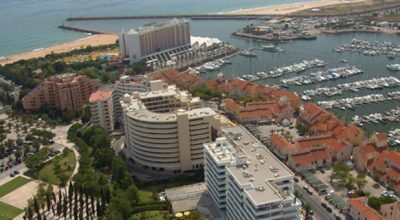 Located in Alvor on the sunny Algarve, you will be staying at the 4 star Pestana Delfim hotel and golf resort. The resort is just a five minute walk to the beautiful golden sandy beaches and around 70 km from Faro International Airport. The package is all inclusive meaning that breakfast, lunch, and dinner buffet, as well as snacks, ice-cream and national beverages are all provided at no extra cost during your stay and perfect for those who do not wish to budget while on their golf holiday in the Algarve. The Pestana Delfim features a total of 240 rooms, all of which offer air conditioning. Rooms also feature a bath, shower, mini-bar, satellite TV, safe, hairdryer and free Wi-Fi. The rooms at the hotel all have balconies and offer either views to the coastline or to the lovely hotel gardens. Guests will have the option of playing 2 or 4 rounds of golf at either of the five Pestana golf courses all of which feature 18 holes. These are Gramacho Pestana Golf Resort, Vale da Pinta Pestana Golf Resort, Silves Golf Pestana Golf Resort and Alto Golf Pestana Golf Resort. In our view, the Pestana Delfim resort is in the perfect location to enjoy a golf holiday in the Algarve. The 4 star hotel offers a high level of comfort and facilities for you to enjoy and also boasts five of its own golf courses. As an added bonus, the resort is just a short stroll to the lovely sandy beaches! Lunch pack available on golf days pre-book 24 hrs before day of play.